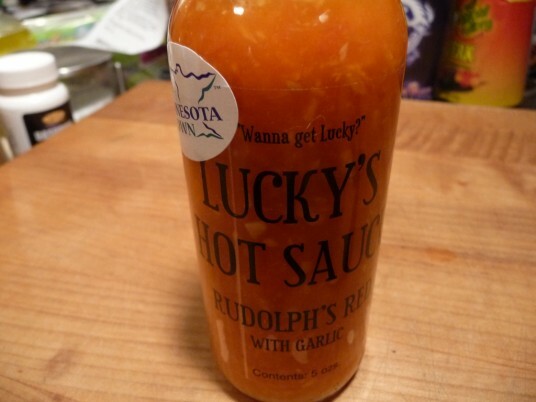 We are reviewing Lucky’s Popcorn Dressing Hot Sauce – Rudolph’s Red with Garlic, our 2nd Lucky’s review. We previously wrote about Lucky’s Jalapeno Garlic sauce. Happily, Rudolph’s Red rates a much better opinion from us. Super bright red in color, with a simple crushed mild red pepper base, Rudolph’s Red is a delicous blend that reminds me of those hoagie spreads, or wet red peppers that are traditional on subs and hoagies. When I pressed owner Mark Porisch about the “hot red peppers” listed, he gave me the standard “… then I’d have to kill you” line. He did kindly add, “it’s a milder variety from the jalapeno family”. While it won’t light you up with intense heat, the mild to medium level of heat is just right and worked very well on pizza, eggs, and even hash browned potatoes. I mixed a little sauce with ketchup and had some fries with it. All very good. Brian: – Yes, 5 stars! I love the appearance, the bright red color, the ton of garlic and pepper bits floating about. Although it too is a bit on the thin side, like it’s cousin Lucky’s Jalapeno, the great flavor and taste make up for the thinness. Marilyn: – a lovely orange color (Brian is color-blind you know), it has a nice consistency. Brian: Doh! It’s red in my eyes. Close-up, Lucky's Rudolph's Red Hot Sauce is bright and delicious. Brian: – to me it’s a hoagie spread in a pourable sauce form. I love it. If it were just a tad sweeter with just a bit less vinegar, I’d give it a solid 5 in flavor and taste. Marilyn: – a strong vinegar taste and quite hot to me, I do like the garlic overtones. A nice addition to a standard mild red pepper based sauce. Brian: – nice mild to medium heat. Marilyn: – easy to eat, the heat goes away quickly. Brian: sporting a sticker that says “Minnesota Grown”, the clear label is simple, to the point and really shows off the contents well. Plain black lettering could use a logo somewhere. Marilyn: The black text stands out well against the bright orange sauce. Nutrition label is tiny. Brian: – I would buy this sauce by the pint! It’s more of a condiment than a sauce. It’s great on pizza, hot dogs, ketchup with fries, eggs. I could just eat this right off the spoon. Marilyn: – Great garlic flavor and a little sweet. Not too much heat to handle, this could be made into a good chili garlic sauce, with the addition of a little bit of chili sauce. 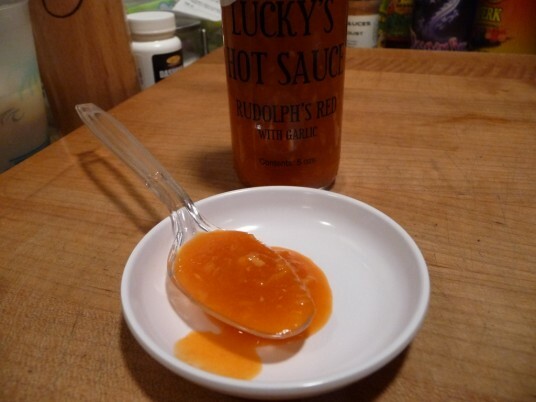 I would like to see them “re-tool” the name… as Lucky’s Popcorn Dressing is so clunky and doesn’t reflect what their sauces really are – hot sauces. Brian: I have to agree, the Popcorn Dressing name is more of a hinderance than a plus – it’s confusing. 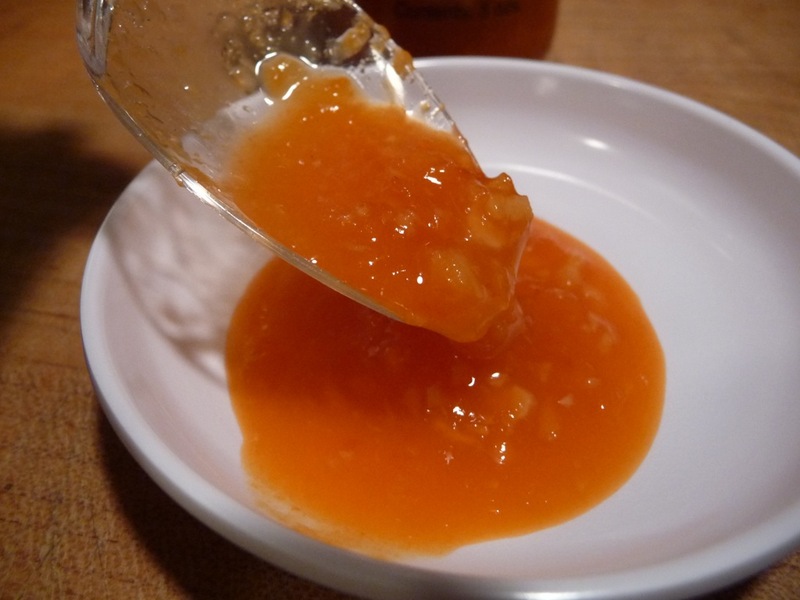 Lucky’s Popcorn Dressing is home to this sauce and 8 other products. We previously reviewed Lucky’s Jalapeno with Garlic Hot Sauce. I am finally getting these out of the Farmers Markets and into stores. Whole Foods in Minneapolis should have most of the hot sauces (including the Jalapeno and Garlic, Rudolphs Red and Habanero and Garlic) in early 2012, depending on production ramp.